As the facebook-less week draws to a close, I find myself only somewhat interested in getting back on the preeminent social network. The experience for me was moderately eye opening, but fun at the same time. I enjoyed cutting out newspaper clippings and posting them to colleagues' walls. I enjoyed asking people to be my friend. I enjoyed colleagues physically posting messages on my door asking to be friends with me. I enjoyed rejecting some of them and then dealing with the conversations that followed. I didn't really miss it. When I logged on Saturday morning I didn't really miss much. My cousin got engaged and I hadn't heard otherwise. I'm sure I eventually would have, but it was nice to see a photo of the rock on her finger. Other than that, I didn't miss a beat. I still felt that I was connected with my friends and family when I returned. So to sum it up, five days without facebook is cake. I returned to my original assertion that facebook employs the perfect design for procrastination and wasting time. It also allows us to vent whatever we want and obtain daily affirmation much like Stuart Smalley did with his mirror on SNL. I admire John Spencer for sustaining for forty days and want to thank him for starting this project and taking time out of his schedule to speak with my students about this project. That experience really highlighted to my students what you can do and learn from a network. It showed that a teacher from Phoenix and a teacher from Boston can come together to orchestrate a lesson that engages students and models good digital citizenship and why it is important to take care of your digital identity. I think my students will remember this experience and look differently at facebook, and social media in general. I think they understand that facebook is not a departure from reality and that it is just another medium by which we can engage, interact and voice our opinions and thoughts. It is not a place where we should mask our identity. Day four of the living facebook project and I'm feeling fine, however my students are starting to get anxious. The link I posted on my colleague's wall has gone viral. Whitten's wall has become the talk of Burlington. 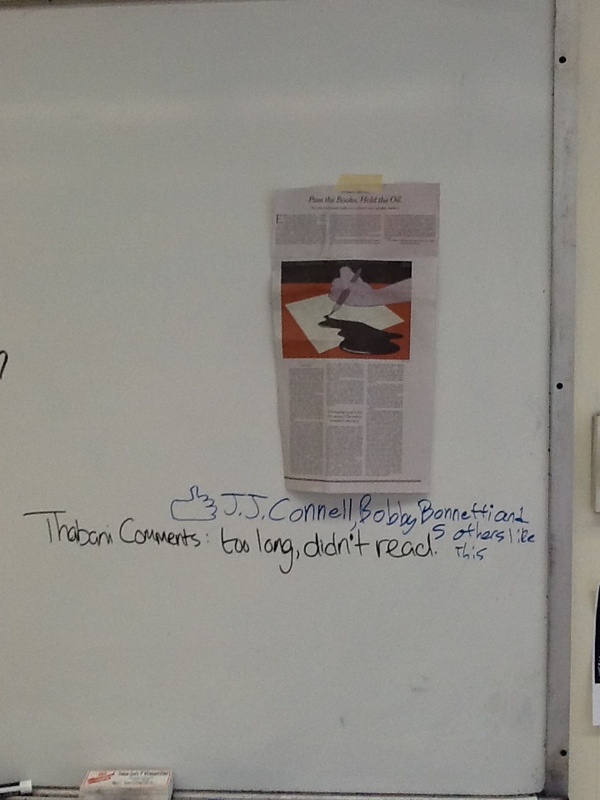 His students are really excited to post comments on his board and keep the conversation alive. It's grown rapidly. The students are starting to see that facebook is not really a place at all and that it is really no different than a wall. It serves the same purpose, however they are beginning to understand the reach and audience that social media commands. This is an important distinction that is not always easily translated to students. Today as we talked about the facebook project I asked them to define the most important 21st Century skill. Many students described skills involved directly with technology. One student said interaction, while others mentioned searching and researching skills. After entertaining all of their responses, I quoted Alan November and said that the most important 21st century skill is empathy. I related how important this skill is in a global economy and an increasingly connected world. We then transitioned the conversation to a Google doc and came up with some great responses to several questions associated with civility, citizenship, empathy and maintaining and molding your digital spaces. While this conversation was unfolding on the Google Doc, we were greeted by a group of administrators and teachers who were visiting Burlington. The students explained to our visitors what they were discussing on the doc and the crowd was impressed with their responses. My students immediately relayed the importance of maintaining their digital identity and how someday they will be expected adapt to and use these spaces effectively. Also, they started to see social media as an opportunity for their future as opposed to something that is deemed bad by many. It was one of those moments as a teacher that makes you very proud. Today's living facebook project was not really about facebook at all. It was about students understanding their responsibility in a variety of digital spaces. Also, it reinforced how important empathy is in a global economy and an increasingly connected world. When I left my last post, I came to the conclusion that facebook is a giant time waster. What's more, is that facebook is not something I would classify as 'missing'. What I do miss is the opportunity to share with people that only use facebook. With that element lacking, I decided to take sharing back to the basics and see what others thought about the analog process. So my question is...what happens when you want to share without any audience? And share with an audience of one? More, what would a connected room of students think about this form of analog sharing. I'm also wondering if people share more for the affirmation or more to genuinely help everyone in their network? Despite having more devices than I know what do with and a digital subscription to the New York Times, I still enjoy reading the print edition of the Sunday Times cover to cover. Call me old fashioned, but there's something very romantic about the Sunday Times. Along with Charles Osgood, I look forward to it each Sunday morning. This past Sunday I read a really interesting piece by Thomas Friedman that examined countries that have abundant natural resources versus those that don't. The countries that did not have an abundance of resources had more invested in education and performed better academically than those with the greatest natural resources. Regardless of the study, I found it to be an interesting read. I decided to bring it into school, cut it out, and share it with a history teacher. Today during Todd Whitten's US-China relations course, I interjected briefly to share the article. However, the first thing I did was to ask Todd if he would like to be my friend. I know Todd, but wanted to make sure we were friends before sharing something with him. Especially if I'm affixing that information on his wall. I asked, "Todd, would you like to be my friend?" "Andy Marcinek is now friends with Todd Whitten"
I then took the newspaper clipping that I found in Sunday's Times and tapped it to his wall. After I posted it, I asked for comments. I later found out that several students liked our new friendship and commented on the article that was affixed to Todd's wall. The students, along with my colleague, enjoyed watching me live out something we unconsciously do in the social media realm on a daily basis. So I'm curious. Why do we share? Do we share for us? or do we genuinely share to make others better? I'd like to think the latter, but I'm not sold completely. I imagine that some share simply for the affirmation and if you took away the social media platform that person may share less because the spotlight is limited. Obviously, this is a very cynical theory, but I'd like the comments that follow on this post to discuss this point and address the question: Why do we share? And would we share the same way if the social media vehicle didn't exist? 2. Facebook is designed perfectly for wasting time and procrastinating. Yes, I occasionally wonder what’s happening in my news feed and if I am missing any great photos or videos of cats falling off of counter tops, but I'm using other venues for information and sharing. And that’s what I find myself missing most. Not so much the cats, but having the venue to share information with my friends and family that don’t use Twitter or any other social network. The same goes with photos. Yesterday I was at the dog park and wanted to share a picture with Facebook. Instead, I sent a photo text of my dog to my mom and a few friends and demanded that they comment and like it. They did. Beyond the time consumption element, I’m discovering that Facebook is a great party. Everyone is there that you want to be there and it’s usually a good time. It can be a private party or a giant mixer. Most of the conversation is geared towards positive interactions and gaining affirmation. It’s a place where we feel good and can glean some positive reinforcement during a bad day. Facebook is about us. It’s like Cheers: It’s a place where everybody knows your name. Today was my first day in sometime without Facebook. I woke as normal with my iPhone ringing as my alarm. While I adjusted to losing one hour this past weekend, I still managed to gloss over my emails and twitter feed after I hit snooze. I noticed the giant blue 'f' on my iPhone homescreen and decided to move it into a folder. I then decided to delete it all together and download it again next week. I found myself tempted several times throughout the day to check the site. I also started to realize that my attraction to facebook was on the level of watching reality television. For some reason, like most of us, I'm drawn to human flaw and awkwardness. I find this a lot on facebook. It's like all your friends standing out in a field yelling their problems, their triumphs, their favorite quotes, etc, but none of them are wearing pants. It's loud, and awkward all at the same time. And honestly, no one really cares, we're just all looking for affirmation. Facebook, and any social network is about us. It's trying to be there first; It's trying to be original; It's trying to be the coolest kid in school; It's trying to achieve some type of pseudo legendary status among your closest friends. It's vain. My first day without facebook was not about trying things I usually do on there in real life, but more about seeing it for what it is. Facebook is a great place to connect, and reconnect with friends and family. It's a place where I can connect with my parents, aunts, uncles, cousins, etc. all in one place. It's a place where I can easily plan a dinner party and remember a birthday. It's a place to kill time and share links, photos and videos. It's a place where I am 'friends' with my Mother. It's a place that I can easily let go. Facebook is nothing new. It's not original, nor is it revolutionary. Facebook has been happening for years only in different forums and through different mediums. Some of our oldest ancestors were writing on walls long before Mark Zuckerberg's great, great, great grandparents were born. My first day away from facebook helped me remember that facebook is not something I need, but just another podium from which we can all yell. Tomorrow I hope to make some new friends and I hope they can suggest some new friends that I may like. Stay tuned. Starting next Monday, my digital literacy students will be living facebook. For five whole days, they will not be logging into the preeminent social network and instead, living out their daily interactions on Facebook in real life. I discovered this project a few weeks ago when I was perusing twitter and happened upon an exchange between Dean Shareski and John Spencer. The link that followed took me to the “Living Facebook Blog: 40 Days of Doing Facebook in Person”. What I discovered was one man’s epic journey of 40 days without Facebook. Everything Mr. Spencer did on Facebook he would now be engaging with in real life. The goal was to compare his experience off line and on Facebook. A simple, yet effective look at what it’s like to remove oneself from a place we travel on a daily basis. Today, John Spencer will be speaking to my students virtually and discussing his experience with living Facebook. I will also be engaging in this project with my students and blogging about the experience. My students will all be writing reflection posts each day on their experience and highlighting certain aspects of what they did differently. Also, we will have a a daily Twitter chat discussing this project in class and students will be creating video reflections at the end of the project to detail their experience.